Need a quick dinner after a busy day, or a light weekend lunch? Tuna sandwiches are great, but easy-to-make crab melts are even better. Your family may be surprised by this change in a melt, but they’ll probably like it. 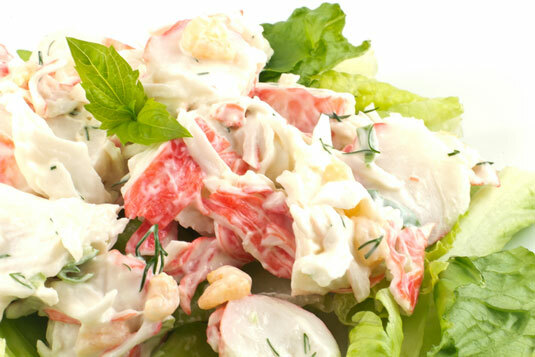 Have the kids help assemble all the ingredients and mix up the crab salad. Each person can make her own sandwich (but make sure an adult cooks them up). Preheat the broiler on high heat. In a medium bowl, combine the crab, celery, red pepper, green onion, cilantro, lemon juice, mayonnaise, and Old Bay seasoning. Place the rice cakes on a baking sheet. Spread 1/4 cup crab mixture on each. Sprinkle each with 2 tablespoons of shredded cheese. Broil until the cheese melts, about 3 minutes. Per Serving: Calories 240 (From Fat 70); Fat 8g (Saturated 2g); Cholesterol 65mg; Sodium 650mg; Carbohydrate 20g (Dietary Fiber 1g); Protein 22g; Sugar 2g. You can substitute fresh crab for the canned, but don’t substitute with imitation crab. It’s usually made with Alaskan pollock and contains no crab whatsoever, and because it’s highly processed, it’s much higher in sodium than real crab meat. If you don’t like cilantro, simply switch to fresh parsley. Old Bay seasoning can be found in the grocery store in the spice section. It’s a blend of herbs and spices typically used to season seafood but you can use it on chicken, beef, or vegetables as well. The blend contains salt so you don’t need to add additional salt when using Old Bay.